Social Anxiety Youtube Channels List. The Best Social Anxiety Youtube Channels from thousands of top Social Anxiety Youtube Channels in our index using search and social metrics. Data will be refreshed once a week. About Youtuber Hi, I am Johnny Berba, a dating and life coach in London. I specialise in coaching men who suffer social anxiety and lack confidence with women. I have mentored hundreds of men on my programs and literally transformed not only their dating lifes but helped them develop confidence in all areas such as worklife, family or social relationships. About Youtuber Learn powerful confidence secrets from social confidence expert, Dr. Aziz. After struggling with shyness and social anxiety for over 10 years, Dr. Aziz discovered the path to ever-increasing social confidence. He now works with clients from all over the world to help them break through their social fears to create a life that truly inspires them. About Youtuber As an ex social anxiety disorder sufferer I share with you the best techniques, strategies and insights gathered from my own journey to social confidence. Social-Anxiety-Solutions.com helps you with practical exercises to change your brain to overcome any social anxiety forever. Change limiting beliefs and negative emotions and improve your social skills. About Youtuber This is my social anxiety disorder video blog, where I talk about natural ways to heal anxiety and relieve anxiety symptoms. Is there a cure for social anxiety? Yes, I certainly believe there is. In these videos I discuss what anxiety is from an energetic perspective, and talk about subtle and gentle yet powerful ways that you can work with your energy field - your aura - to reduce anxiety naturally. About Youtuber Hi, my name's Mark. I have social phobia, also known as Social Anxiety Disorder. I share my story through BulletProofMonkeon. About Youtuber On this Channel Roxy shares her experiences about living with social anxiety. About Youtuber The Social Anxiety Institute helps people recover and move forward with life. With so many people suffering from Social Anxiety and looking for answers, we want to provide a look at real people overcoming Social Anxiety Disorder. All of the videos include volunteers who agreed to participate in hopes that their experiences might help others. About Youtuber Hello. My name is Chris Strickland and im from Pensacola Florida. This channel is where I vlog about my lifelong struggle with major depression and social anxiety. I tell a story of what its like to be alone and have no friends, to be exiled from the world. About Youtuber Hi, my name is Wing, I have social anxiety, asmr and my own thoughts. I hope you enjoy my videos. About Youtuber Welcome to my world of introversion, social anxiety and general awkwardness. About Youtuber Jeff is guy with social anxiety sharing his experiences. About Youtuber I am Dale Channel. I'm lonely and suffer with Social anxiety. On this channel I share my struggles dealing with social anxiety. About Youtuber I have decided to set up this channel in order to help share my experiences of living under the mist of social anxiety and depression, the two tend to come as a pair. In sharing my experiences with you I hope it at least offers some comfort in showing that you are not alone in living with this condition. About Youtuber My name is Stephan Gunville, I talk about and aspire to help people with social anxiety & shyness, anxiety, depression and addictions. Freedom Academy HQ is a website designed to guide and help people build a life of freedom. About Youtuber Hey guys. I'm here to give an inside look about what Social Anxiety Disorder really is and how it effects every aspect of your loved ones & your life. If you think you might have it, this channel might be great for you. Even if you don't have S.A.D and are just struggling socially, I'd love to help you overcome it and maybe we can grow together. About Youtuber Crush Social Anxiety offers videos to overcome social anxiety. About Youtuber The National Social Anxiety Center is dedicated to disseminating education about social anxiety and providing evidence-based therapy through our regional social anxiety clinics. You may have social anxiety if the fear of judgment, embarrassment, scrutiny, criticism or rejection inhibits your life. About Youtuber Follow this channel to find more about social anxiety from a personal perspective. About Youtuber A video series that provides strategies and techniques from CBT therapy I've learned that will help you in your journey to getting better from Social Anxiety. About Youtuber Diary of The Socially Anxious, is about my life with social anxiety. About Youtuber This a channel dedicated towards finding solutions on overcoming social anxiety. 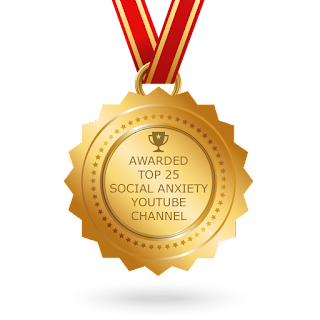 CONGRATULATIONS to every youtuber that has made this Top Social Anxiety Youtube Channels list! This is the most comprehensive list of best Social Anxiety Youtube Channels on the internet and I’m honoured to have you as part of this! I personally give you a high-five and want to thank you for your contribution to this world.